Consolidated Carpet hosted a company volunteer event this past Tuesday and Wednesday with the help of St. Francis Food Pantries & Shelters. The PB&J Sandwich Making Days are one of the many events that St. Francis holds in the effort to alleviate the physical and emotional hunger of the less fortunate. St. Francis provides a network of services and programs that counsels, feeds, and clothes those in need. 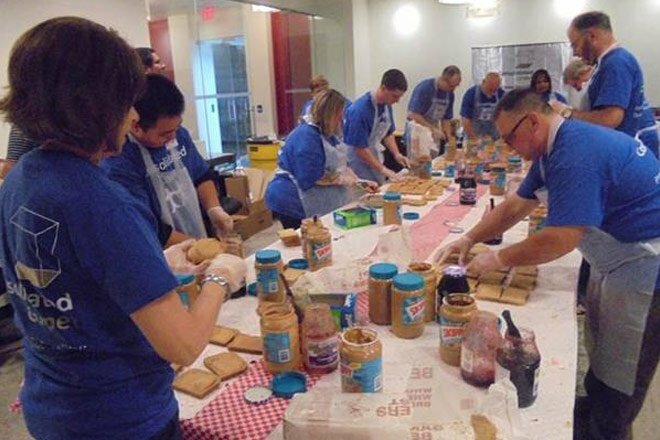 Associates from the NY and NJ offices and warehouse gathered in both offices to make sandwiches for the Bed Stuy Campaign Against Hunger and the Hoboken Shelter. The volunteers made a total of 3,424 sandwiches. This was a new record for St. Francis and a successful first PB&J Sandwich Making event for Consolidated Carpet. “Thank you to all who have participated in this great event and helped to feed thousands of hungry people. I am proud of our success and the contribution from all of the Consolidated Carpet associates,” CEO David Meberg said. include Fortune 500 corporations, professional service firms, luxury hotel properties, institutional properties, real estate owners and general contractors. To learn more, visit ConsolidatedCarpet.com.